Just as the sun is setting in the west this weekend, look to the east and see the harvest moon and Jupiter rising. Whilethe moon is always something special, the harvest moon, visible all of thiscoming week, is the most special of all. It is the subject of everything fromepic poetry to popular songs. Whatmakes the harvestmoon so special? Mainly it?s the path it?s following this week. The moonalways travels close to the ecliptic, the path of the sun and planets in thesky, but this week the ecliptic is at a particularly shallow angle to thehorizon. The result is that themoon never gets too far above the horizon all night long for a number ofnights in a row, putting it literally ?in your face.? Thereis a well known but poorly understood optical illusion known as ?the moonillusion,? whereby the moon, when low in the sky, appears much larger than itdoes when high overhead. This really is an illusion, as you can see foryourself by blocking the moon with a finger held at arm?s length: the moon isno bigger on the horizon than overhead. When themoon is low in the sky, it is also strongly subject to appearing yellow,orange, or red due to air pollution, particularly caused by forest fires thistime of year. So wehave a? low moon, in your face, artificially enlarged, and often brightlycolored: the famous harvest moon. Take alook at this illustration. It shows the harvest moon as seen from Calgary,Alberta, at 6 p.m. this Saturday evening. The sun is setting behind you in thewest, and the moon is rising in the east, Jupiter to the southeast. 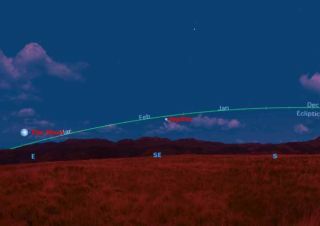 Notice theshallow angle between the ecliptic (in green) and the horizon, typical nearfull moon at this time of year. The effect of this shallow angle is that, eventhough the Moon moves about 12 degrees along the ecliptic every night, itsrising time doesn?t change very much from night to night. Thismeans a succession of nights with a bright moon low on the eastern horizon,lighting up the land just as the sun sets opposite it. This gives a few extrahours of light to farmers out harvesting their crops. Hence the name: harvestmoon. Theharvest moon, while beautiful to look at, also presents some great ?\photoopportunities. However, if you just take a snapshot of the moon in thelandscape, you may be disappointed. Because the ?moon illusion? doesn?t affecta camera lens, the moon will look small. If yourcamera has automatic exposure, the scene will look too bright and the moon willbe overexposed. The trick to capturing the harvest moon in a photograph isfirst, to zoom in with your telephoto lens to make the moon appear larger, andsecondly, to underexpose the picture by a couple of stops, to darken thelandscape, saturate the colors, and expose the moon properly. Good luck!